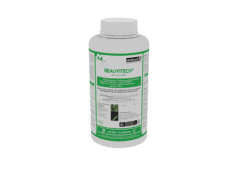 BEAUVITECH ® WP is a wettable powder (WP) formulation containing spores of Beauveria bassiana strain J25 at a concentration of 1.0 x 1010 spores per gram in an inert carrier..
Beauveria bassiana is a naturally occurring insect killing fungus that is used in the control of whiteflies, Thrips and Aphids It is known to cause the white muscadine disease in insects. Fungal conidia become attached to the insect cuticle and, upon germination; the hyphae penetrate the cuticle and proliferate in the insect's body. Relative humidity of above 70% and temperatures of between 18 – 30°C are essential for conidial germination. Infection establishes between 24 and 48 hours. The infected insect may live for 3-5 days after hyphal penetration and, after death conidia are produced on cadaver. Best results will be obtained when treatment starts early before pest populations become heavy. Mix the required amount of BEAUVITECH ® WP with water using 2 litres for every 250g product; stir well to form a uniform suspension. Add the suspension to the required volume of water in the spray tank and mix well. Add the required amount of an appropriate wetter at recommended rates and mix thoroughly. (Information on the appropriate wetter may be obtained from Dudutech). After mixing with water, the product should be sprayed as soon as possible; DO NOT store overnight. Thorough coverage of the leaf surfaces where the insects are to be found is a must to obtain good efficacy. Apply using High volume spray equipment. Maintain a minimum Relative humidity of 70 % for at least 12 hours. Highest infection levels are achieved at temperatures of between 20 - 28°C. Best results will be achieved when applications are done early morning or late afternoon. Frequency of application varies with the pest pressure and their susceptible life stages. Generally it is recommended to spray every 5-7 days with between 2-4 repeat applications. It is recommended to apply BEAUVITECH ® WP at 250g per hectare with a water volume of 1500 – 2000 Litres depending on crop canopy with the aim of having the fungal spores evenly distributed on the leaf surfaces. Store in a cool, dry place in tightly closed original pack. Do not freeze and do not allow the product to undergo thermal shock. May be stored in original unopened container for six months at temperatures of 6 – 12° C.
BEAUVITECH ® WP is compatible with most Biopesticides and insecticides; however it is generally recommended that the grower refer to the Dudutech pesticide side-effects compatibility guide since some chemicals may have detrimental effects on Beauveria bassiana, as it is a living organism. Avoid chemical fungicide spray at least 3 days before and after using BEAUVITECH ® WP.